The machines in this gallery emphasize the main line of phonographs that were the key in establishing Victor’s supremacy in the industry. 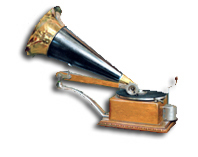 The first inside horn model, the VTLA, was introduced in 1906 and the term “victrola” became genericized trademark for talking machines. The images are from the 1911 edition of the Victor Talking Machine Company’s general catalog.